Eisenia foetida are a type of earthworm. Other common names include: redworms, brandling worms, "tiger worms", manure worms, and red wigglers. Must be chopped for smaller fish. It's available from aquarium stores, bait shops, or online. As with giving your animals any live food, there is the risk of adding parasites and dieases to your tank. 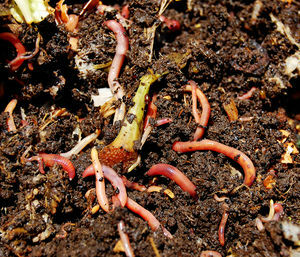 Culturing red wiglers is also a way to get rid of your kitchen scraps and get compost for your garden. It is called vermicomposting. There are special "worm bins" avalible or you may make one out of wood or a large plastic container. A popular book on the subject is "Worms Eat My Garbage" by Mary Appelhof. This page was last edited on 14 February 2011, at 02:35.